has unique crispy texture and sparkling colour. Your dish looks more beautiful by decorating with this noodle, after wash and cut. The colour variations are clear, pink and yellow. 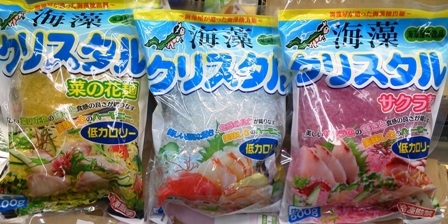 We reccomend this to use for salad or ingredients of spring roll etc..
日本の鮮魚・食品・酒をお探しの方向けの商品案内ブログです// For food importer looking for Japanese fish, sake and other foodstuffs from Japan.